News pertaining to the world of Independent Irish Film. 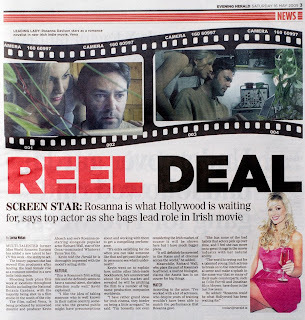 Ireland's Evening Herald newspaper today features a cover story revealing former Miss World (2003) Rosanna Davison, the daughter of legendary songsmith Chris de Burgh, as having landed the female lead role in VENA, a feature film directed by renowned photographer/director Kevin Abosch and co-starring Richard Wall (star of the Oscar-nominated short Whatever Turns You On). Davison, a model and regular fixture on the Dublin social scene is a familiar face to those who read the gossip rags. In VENA, she plays the role of a romance novelist whose relationship with a botanist played by Wall, is strained by his obsessive research into plant consciousness. Aparently, he is more into plants than he is into her. Science-fiction it seems. In the Herald article director Abosch gushes about her "natural talent" and ability to take direction so well. VENA, was shot entirely in Dublin and marks an exciting new turn for Irish film. From what we gather, it seems to be an artistic, sci-fi film with international appeal. It will surely play well on the festival circuit and perhaps launch the career of one of Ireland's most beautiful women. - Click on the image above to read the Herald article. WIDE OPEN SPACES, directed by Tom Hall and starring Ardal O'Hanlon (Father Ted) is having its world premiere at the 63rd Edinburgh International Film Festival which will take place from June 17 - 28. Written by Arthur Matthews (Father Ted), it has been officially selected to screen in the Rosebud Discovery section of the festival which features "first and second works from the directors to watch". Ewen Bremner (Fool's Gold) and Owen Roe (Alarm) also star in this belated coming of age comedy with a unique take on male friendship and how sometimes it is easier to break up with a girl than with your best straight male friend. Wide Open Spaces is produced by Irish company Grand Pictures (The Race) and Scottish company Mead Kerr (Night People) with funding from Bord Scannán na hEireann / the Irish Film Board, Scottish Screen, RTÉ and BBC Scotland. The Edinburgh International Film Festival will take place June 17th - 28th. Last night the Irish film industry continued its successful relationship with the Tribeca Film Festival as Irish actor Ciarán Hinds (Harry Potter, Munich) scooped the Best Actor award for his performance in Conor McPherson’s new film THE ECLIPSE. This is the second year running that the Irish film industry has picked up a major award at Tribeca. Last year Irish actress Eileen Walsh picked up the Best Actress for her performance in Declan Reck’s film EDEN, while the Oscar nominated short film NEW BOY scooped the award for Best Narrative Short Film. 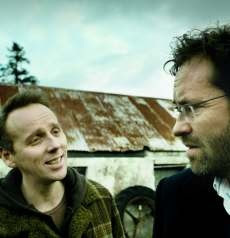 Written by McPherson and Billy Roche, the supernatural drama screened as part of the World Narrative Feature Competition category during the 12-day festival, and has received very positive reviews from the critics to date. The New York Times said the film was one of the four strongest candidates in competition, the Associated Press highlighted it as one of three films in competition "worthy of attention", Variety said that it was a film “of seductive grace” and the New York Magazine said that it was the best competition film reviewed this year. Rob Walpole, the producer of the film, said “We have had such a fantastic reaction to THE ECLIPSE here in Tribeca. The film has really resonated with audiences and Ciarán Hind’s performance has been central to that. This award is a great recognition of his work in this film and his powerful skills as an actor. We are delighted for him”. 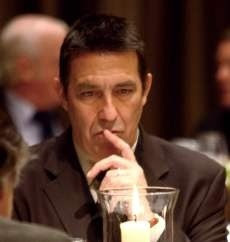 THE ECLIPSE tells the story about a widower (Ciarán Hinds) who is haunted by nightmarish visions. When he volunteers at an international literary festival, his life converges with a beautiful author of supernatural fiction (Iben Hjejle) and a self obsessed novelist (Aidan Quinn) drawing them into a life-altering collision between the living and the dead. The acting talent in the film has been particularly applauded with Variety describing both Quinn and Hind's performances as "brilliant" and the Village Voice saying "the acting was just superb". Hinds made his feature film debut in John Boorman's Excalibur (1981) and has a long list of feature film credits to his name including Munich, Miami Vice, Mickybo & Me, December Bride, Road to Perdition, Calendar Girls and Race to Witch Mountain. He has also worked widely in both theatre and television. Produced by Rob Walpole for Treasure Entertainment with funding from Bord Scannán na hÉireann / the Irish Film Board, RTE and the BCI, THE ECLIPSE shot on location in Cobh, Co. Cork last September. Sales for THE ECLIPSE are being handled by Submarine and Irish audiences will have an opportunity to see THE ECLIPSE when it is broadcast on RTE 1 later this year. Marking the second Irish feature length animation to be released in Ireland in the past year, IFTN talks with director Tomm Moore ahead of the release of his lavish debut feature ‘The Secret of Kells’. Set for nationwide release on Friday 6th March by Walt Disney Studios Motion Pictures, Ireland, ‘The Secret of Kells’ introduces the vibrant work of director Tomm Moore and the team at Cartoon Saloon, the Kilkenny based animators behind the IFTA winning series ‘Skunk Fu’. The film is also the work of a partnership with animators and producers from France’s Les Armateurs and Belgium’s Vivi Film. With the backdrop of the Viking raids on Ireland, the animation follows twelve-year-old Brendan who meets an elderly Brother Aidan, the keeper of an extraordinary, but unfinished book of illuminations. Aidan sets Brendan the task of completing this legendary book for which he must overcome obstacles and face his deepest fears to carry out his duty. 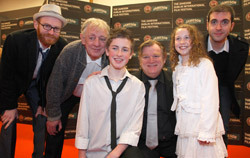 Irish talent lending their voices to the film include Brendan Gleeson who plays Brendan’s strict uncle, Mick Lally as Brother Aidan and newcomers Evan McGuire as Brendan, and Christen Mooney as mysterious fairy girl Aisling. Original music was provided by Academy Award nominee Bruno Coulais of the Palm D’or winning ‘Les Choristes’ (The Chorus) and Irish trad band Kíla. The Film was supported financially by BCI, Irish Film Board, Celluloid Dreams, Canal Plus, Gebeka, FTD Video, Eurimages and RTÉ. Having the title of Best Irish Film at this year's Dublin International Film Festival under it’s belt, ‘The Secret of Kells’ has also received nominations for the upcoming Cartoon Movie Tributes in France. Last year also saw director Tomm Moore selected by the Screen Director’s Guild Directors Finders Series to showcase the film at the Director’s Guild of America Theatre, LA. In our interview, Tomm talks to IFTN about the new style of ‘illuminating animation’ the film encompasses and the current Irish animation industry. Irish actress Jenn Murray, who starred in the IFB funded film Dorothy, has secured a leading role in the new remake of the BBC drama The Day Of The Triffids. The sci-fi tale about terrifying giant plants is adapted from the 1951 novel by John Wynham and the modern version will be penned by ER and Law & Order writer Patrick Harbinson. Murray will star alongside Vanessa Redgrave (Julia, Howard's End), Dougray Scott (Mission Impossible II, Desperate Housewives) and Joely Richardson (Nip/Tuck). Whereas the BBC's 1981 The Day Of The Triffids was set in the late 20th century, this version will take place in 2011. Updating it for modern audiences, the two-part drama revolves around a hunt for alternative sources of energy after the world's fossil fuel supply runs out. Belfast born teenager, Jenn Murray is currently in the UK filming scenes which are due to be aired late this year. Jenn, who has appeared in The Clinic, made her breakthrough with an outstanding performance as the title character in Dorothy, an IFB funded supernatural thriller. Her role as Dorothy was hailed by Screen International, the influential trade magazine, as a "tour de force", and also secured her an IFTA nomination in the Best Actress in a Lead Role Film category. The IFTA awards are due to take place on February 14th. 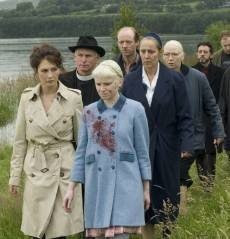 Dorothy will be screened this month as part of the Jameson Dublin International Film Festival.